Because the internet never fails to find the worst possible way to deal with any given event, the above image is currently being passed around on Twitter as this morning's downed Malaysia Airlines flight MH17. It is not. It is a screengrab from Lost. 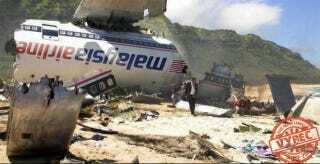 This isn&apos;t the Malaysia Airlines crash. It&apos;s Photoshopped from Lost.